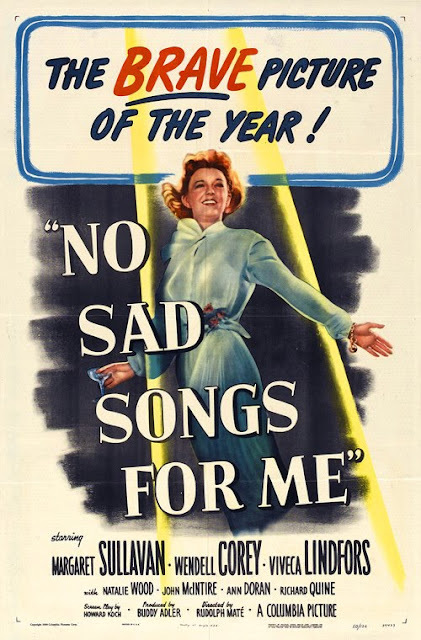 No Sad Songs for Me is an atypical postwar Hollywood tearjerker. A woman learns she is dying of cancer and decides to withhold her prognosis from her family, while secretly encouraging the woman she hopes will eventually take her place. What makes this movie so atypical is the presence of the leading lady, Margaret Sullavan, a sublime actress of exceptional skill, who has nevertheless been forgotten over the years by the general public. Her life was tempestuous: married four times (including a 60-day stint with Henry Fonda), torn between Los Angeles and Broadway, and often both severely physically ill and mentally depressed. Sullavan never enjoyed the stability of one able to choose a coast and settle there. She’d give birth to three children, two of whom would eventually commit suicide, though neither would do so while Sullavan herself was still living. The troubled and unhappy actress would die of a barbiturate overdose in 1960 at the age of fifty-one. In spite of making only sixteen films, she was as highly regarded as any actress in the business. Unlike most, she left Hollywood on her own terms. Other aging actresses faded from the film scene for a variety of reasons, but Hollywood always had a part waiting for Sullavan. Her performances are nuanced and damned smart—and she was gifted with an extraordinary voice. She starred opposite Jimmy Stewart in three bona fide classics: The Shopworn Angel (1938), The Shop Around the Corner (1940), and The Mortal Storm (1940). Her best performance, in Three Comrades (1938), with Robert Taylor and Franchot Tone, earned her only Oscar nomination. She made No Sad Songs for Me after a seven-year breather, and it would end up being the final film of her career. For the remaining decade of her life, she confined her efforts to the stage and an occasional television appearance. Although No Sad Songs for Me has the same melodramatic honeycomb as a Douglas Sirk picture, it’s saved by subtle and clever casting—and not just in Sullavan's case. Each of Columbia boss Harry Cohn and director Rudolph Maté’s choices keeps the film from straying into histrionics. Wendell Corey plays Sullavan’s husband. Most often utilized as a foil to a more charismatic and romantic male star, Corey’s sensitive, wry screen persona is perfect here. You could argue that his limited range mars the picture in one crucial moment, when he finally learns the truth about his wife’s condition, but on the whole his presence is a lesson in inspired, slow-burn restraint. The movie's other woman is Swedish actress Viveca Lindfors, who plays Corey’s co-worker, and isn’t so beautiful or glamorous that you can’t imagine her ending up with him. Little Natalie Wood plays the kid. The film benefits from a well-constructed script, tight as a drum from start to finish. It favors the romantic triangle over Sullavan’s struggle to come to grips with her illness and her relationship with her daughter, but it’s entertaining enough that you won’t care. Although there are some routine elements of 1950s scandal / gossip present, the film doesn’t linger on them. No Sad Songs for Me is worthwhile for softening the tired Depression-era cliché of the dying wife and mother. Sullavan herself had already starred in one the preeminent such films of the 1930s, Three Comrades. It’s clear that by the early 1950s (and in the wake of the war) filmmakers were less concerned with Greek tragedy and more aware that life moves on the wake of death.